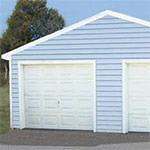 This information covers basic information on building a single-story detached garage. There are many construction methods out there, and this guide is only meant to assist the beginning do-it-yourselfer in understanding the undertaking of building your own. How big would you like the garage to be? Do you need extra space for equipment, storage, a work area? How big of a garage will your city ordinances allow? Height, property lines, yard configuration, and square footage requirements may all take part in determining your garage size. How big of a Garage Door do you need? Standard height is 7’ high, but RV’s, farm equipment and larger vehicles may need a taller door. A typical 1-car door is 9’ wide and a 2-car door is 16’, but there are many sizes to chose from. Garage doors should be at least 12” shorter than the wall height. Where and how many entry doors and windows? What type of roof covering? Common choices are 3-Tab or dimensional fiberglass asphalt shingles, and painted ribbed steel roofing. Another thing to consider is roof pitch. A common roof pitch is 4/12 (slope rises 4” for every 12” horizontal) but you may wish to match slopes with your house or for your climate. 3/12 is the minimum recommended for shingles or metal roofing. What type of siding? Common choices are: vinyl siding, T111 plywood siding (4’x8’ panels), 12” lap siding, and ribbed steel siding. Visit your city’s website or Planning and Zoning office to learn about the permit and building plan process, and any special restrictions in your area. Get your plan approved by the city and obtain your permit. You may need: Application for Building Permit, a Site Plan (your property with the proposed garage location drawn), Foundation (concrete) detail, Elevations, Floor Plan, and a Cost Evaluation. Get quotes and contracts from any subcontractors. Begin construction, getting inspections as required. Inspections may be done in several stages, with many being combined in one visit. Inspections will generally include, but not limited to: 1. Set back, side yard and excavation 2. Footings, rebar and concrete 3. Exterior sheathing 4. Roofing 5. Insulation 6. Framing 7. Siding 8. Electrical 9. Drywall. Lay your foundation. Be sure that your slab is square and your sill plates are level. Apply wall and roof sheathing. Install windows and entry doors. Sill Plate: The bottom plate of the garage stud wall. 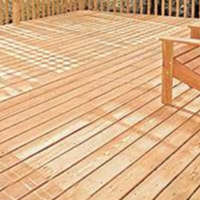 Typically 2x4 treated lumber, in some locations redwood lumber may be used. They must be bolted to the foundation with foundation anchors or foundation bolts. Bolt spacing will depend on local building codes. Bolts should be placed within 12” of an end, but not less than 7 times the bolt diameter. Bottom plates may be spliced anywhere but top plate splices may only occur in the center of a stud. Splices in top and bottom plates must be separated by a minimum of 4’. Do not use pieces under 6’ if possible. Studs: Studs are commonly placed 16” on-center. 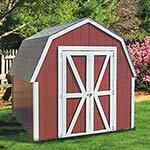 Other spacing's may require 12”, 19.2” or 24”, depending on garage design and local codes. Use 16d nails to fasten. Rough Openings: Refer to the framed openings for a door or window before the opening is finished with trim or product. An entry door opening is usually 2” wider and taller than the door size. For example, a 36” (or 3/0x6/8) door may have a rough opening of 38”x82”. A window rough opening is 1/2” larger than the measured window size. A window listed as 36” W x 24” H (3/0x2/0) may actually be 35-1/2”x23-1/2”, therefore the rough opening in this case will be 36”x24”. Trusses: Unless your garage is designed otherwise, trusses will be 24” on-center. The end, or “gable” trusses, will be flush with the outside of the walls. Regular, or “common” trusses, will be all the trusses in between the gable trusses at 24” spacing. 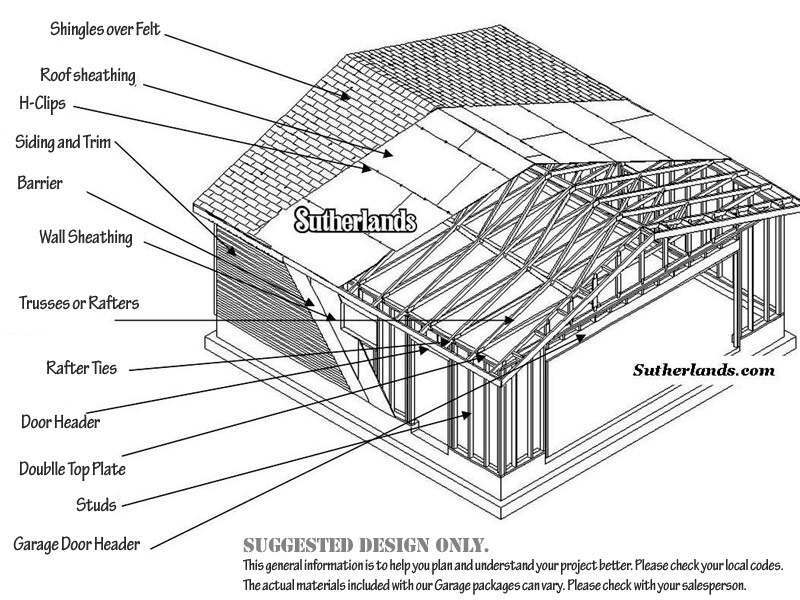 You will need to specify roof pitch, Top Chord Live Load (snow load), and overhang depth when ordering. Trusses will be nailed to the double 2x4 top plate using 16 nails. Most codes require hurricane or rafter ties to tie in the truss to the top plate at every or every other truss. The tails of the trusses are capped of with a sub-fascia board, usually a 2x6. Wall Sheathing: Wall sheathing is commonly 7/16” OSB, 1/2” OSB or 1/2” Plywood. The sheathing is applied vertically, directly to the studs, using 8d sinker or similar nail. Nails should be spaced 6” along all four edges and 12” in the center of each sheet directly over each stud. Roof Sheathing: Roof sheathing is installed horizontally over the trusses and commonly 7/16” OSB, 1/2” OSB, 1/2”CDX Plywood, 5/8” OSB or 5/8” CDX Plywood, depending on snow loads and local codes. 7/16” OSB can often be used up to a 40# snow load. “H” or ply clips are required for 7/16” OSB on the roof along the unsupported edge, every 2’ between trusses. 5/8” OSB may support up to a 130# snow load, and 3/4” up to 175#. Use 8d nails, 6” along the perimeter within 3/8” from the edge. In the field (middle of the panel) nail every 12” in the center of the truss framing. Install OSB with the textured side up. This will help prevent slipping and also allow the building inspector to view the APA stamp from below. The textured side has grid lines to aid in nailing. Roofing: Shingled roofing may consist of these components: Fiberglas asphalt shingles, ridge cap shingles, 15# felt, metal drip edge, 1-1/4” galvanized roofing nails for shingles, plastic capped nails for felt, and any ridge or roof vents if needed. If the garage is to be heated, ice and water barrier is recommended along the eaves. Metal roofing may consist of these components: 3’ wide ribbed metal roofing panels, 30# felt, ridge cap, eave trim, gable trim, inside and outside closure strips, 1-1/2” metal to wood screws, stitch screws, plastic cap nails for felt, and any ridge or roof vents if needed. Siding: Siding should be installed over a solid surface, such as OSB, plywood or a rigid insulation, with a vapor barrier separating siding and sheathing. The vapor barrier may be a 15# builders felt for vinyl or wood siding, a 30# felt for metal siding, or a more durable house wrap. 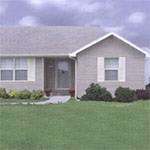 Vinyl siding may include these components: vinyl siding (often sold in “squares” which equal 100 square feet), starter strip, undersill or finish trim, J channel, outside corners, and 1-1/2” galvanized roofing nails. A “snap lock punch” tool may be needed to complete vinyl siding installation. Wood panel or lap siding may include: siding, 8d galvanized casing nails, 1x trim for around openings and corners, and exterior primer and paint or stain. 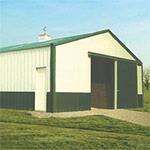 Painted Ribbed Metal Siding may include: 3’ wide ribbed metal siding panels, base angle or rat guard, outside corner trim, J channel, door jamb trim, inside and outside closures, 1-1/2” metal to wood screws, and stitch screws. Drywall: Drywall can brighten the garage, give a much more finished appearance, and covers insulation and electrical wiring. 1/2” drywall is used for walls, except where a firewall between the garage and a house is required, use 5/8” type X. 1/2” drywall may be used for ceilings but 5/8” is recommended to prevent sags over time. Insulation: Unlike a house, there is no R-value code requirements for a detached garage. You may put as little as you like, or even have it insulated as well as your house. Wall insulation is limited to the thickness of the wall. A 2x4 wall will fit R11, R13 or R 15 insulation. A 2x6 wall will fit a R19 or R21. When installing insulation, the Kraft-faced paper always gets placed on the warm side of the wall (inside).